Enjoy a great selection of food at an even better price. No matter what you’re craving, you can be sure to find your favorite foods and more with over 250 delicious choices at Hibachi Grill Sushi Buffet. From our scrumptious Asian specialties to delicious desserts, treat your taste buds to flavorful food prepared with the freshest ingredients. Mouthwatering meals won’t be the only thing that will keep you coming back. You can always expect spectacular service from our friendly staff in a family oriented environment. 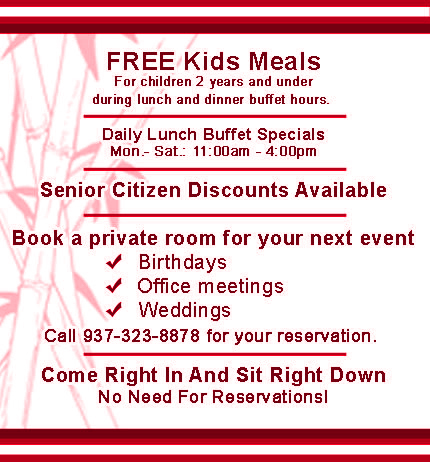 Hibachi Grill Sushi Buffet is the largest and most elegant restaurant serving Chinese, Japanese, and American cuisines. We have over 250 different items on the bar. Plus we have a Hibachi section which you can pick and choose to make up your own menu, so we can cook it on the Hibachi for no additional charge. Lunch And Dinner Menu - Find something for everyone with a wide variety of buffet items including Chinese, Japanese, American, Italian, and Mexican items. Our restaurant was Stacey's Buffet before, there are 13,000 sq. ft., and it is the largest restaurant in Springfield. We are open 7 days a week. We also have 2 huge private rooms available for birthday parties, office meetings, and weddings. Looking for great food that everyone will love? Visit Hibachi Grill Sushi Buffet today at our convenient location in the heart of the Park Shopping Center at 1071 N Bechtle Ave. for delicious food and a delightful experience.